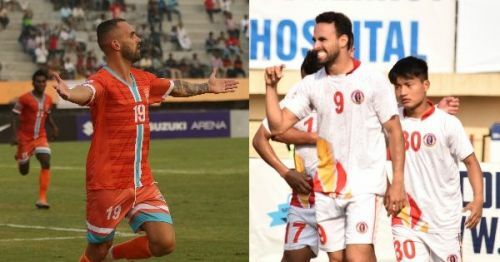 The I-League 2018-19 season is coming to a close this weekend and only two teams, Chennai City FC and East Bengal, are in the title hunt this time around. Just one point separate Chennai City and East Bengal on the I-League table but the odds favour the table-toppers Chennai City to grab the title on Saturday. Chennai City, East Bengal - Who do they face? With 40 points, Chennai City had a solid hold on the top spot of the I-League but a 3-2 defeat to Churchill Brothers on February 28 saw East Bengal close in on them. The Red and Golds defeated Real Kashmir 2-1 and then edged Minerva Punjab 1-0 to move up to 39 points. In the process, East Bengal also shattered Kashmir's I-League hopes and made a serious case for themselves. Both Chennai City and East Bengal will meet teams from the bottom half of the table on the final day. Chennai host Minerva Punjab in Coimbatore on March 9 at 5 pm, while East Bengal have an away game in the neighbouring Kerala state against Gokulam Kerala at the same time. Right now, Chennai City control their own fate while East Bengal's title hopes hinge on Chennai's result. Chennai City will be crowned the champions with a simple victory over Minerva, who are one place from the bottom with 17 points in 18 games. East Bengal's result will not matter in this case. If Chennai City draw, then they will claim the trophy if East Bengal either draw or lose their match to Gokulam Kerala. Suppose Chennai City lose, they can still be crowned the champions if East Bengal draw or lose their final match. 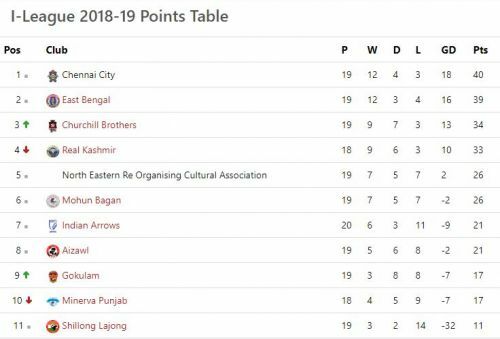 Although an East Bengal draw will see them be equal on points with Chennai City, they will finish second as Chennai City have the better head-to-head record. The I-League follows the head-to-head record to separate two teams equal on points and not the goal difference. Chennai City defeated East Bengal twice this season and therefore, enjoy the advantage at this point. c) if they lose to Minerva Punjab and East Bengal draw/lose to Gokulam Kerala. On the other hand, East Bengal can win the I-League only if they beat Gokulam Kerala and Chennai City draw/lose to Minerva Punjab. Both teams will miss some key players for the final game. Chennai City's Nestor Gordillo is suspended for this match after receiving his fourth yellow card of the season against Churchill Brothers last week. Jobby Justin of East Bengal continues to be suspended for spitting at an opponent during the East Bengal-Aizawl FC game. Check out the full I-League table and Schedule.